Well, as you can see above, my repair job on the side panels (one of which cracked while the other just appeared weak) worked just fine and only added a minimal amount of weight to the boat. The sheer clamps must be attached to the side panels now because it would be very difficult later in the process. 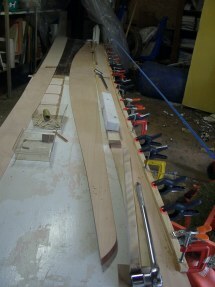 First I had to do more scarf joint gluing to make the long pieces that will serve as the sheer clamps. The sheer clamps are left hanging over the edge by 1/4 inch on purpose. 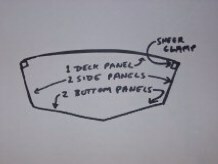 Later I will plane them down to create a good surface for the deck to rest on. 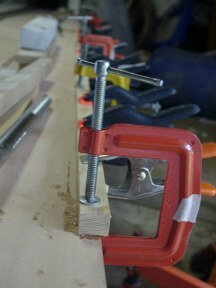 Yes indeed, you need a lot of clamps, in fact one every six inches according to the instructions. I had about 27 and that was just barely enough. The C clamps give a better, more accurate hold so I used those every foot and a half and then filled in the gaps with spring clamps. I placed scrap pieces underneath to protect the wood.